New old songs from the Hotcakes! A couple of years ago, our son Tim recorded Eileen and me in our living room in Bloomington. He did a great job of close mic-ing, and made us sound great. Author MitchPosted on May 5, 2014 May 20, 2016 Categories MusicLeave a comment on New old songs from the Hotcakes! We have played for several years at Bloomington’s Wonderlab during their Meet the Instruments program. Here’s a video of us doing the old Harry Reser song “I’m Gonna Let that Bumblebee Be!” The sound has a lot of echo, and a lot of kid sounds, but that is how it was! Hoosier Hotcakes play at Wonderlab from Mitch Rice on Vimeo. The music scene is much more relaxed in the summer here is Bloomington, there is no doubt. Here I am in a recent photo from the HT, relaxing to the sound of Sarah’s Swing Set during the opening of the B-Line Trail through downtown. 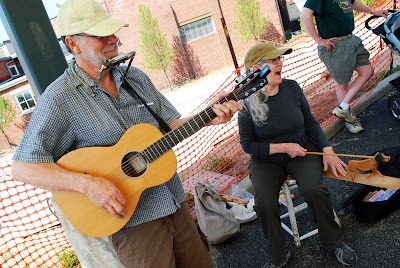 I also saw Fiddle n’ Feet and Jim and Ann along the way, it was a great nite for outdoor music. That’s my boy! Now living in San Francisco, Tim has a new website where we can keep up with him. Here’s a link to his websites where you can his albums Let No Day Be Wasted, The Present is a Gift, and Grand Bakery. Inquell Mograph Demo from Tim Rice on Vimeo. On Saturday nite Eileen and I went to a house party featuring a duo of old-time players (Yannig & Galen) from upstate New York. When we got there, Katie Hicks and Yannig had their fiddles out in the yard. So I grabbed my guitar and tuned up. We went round our little circle picking tunes and playing them. Yannig made an incredible loaf of bread for the party, it was delicious. Yannig came up with a tune he called Texas that was very similar to the tune I know from Melvin Wine that he called Charleston Gals. The A part was nearly identical, but in the B part of Texas slips into a strange minor section that I could not entirely figure out. I’ll have to poke around a little and see what I can find. It may be like Rocky Mountain Goat, which sounds like Whiskey Before Breakfast, yet it is substantially different. Charleston Gals I learned when we were playing with Jake Krack, Jake learned it from Melvin Wine, master fiddler of West Virginia. I got to meet and play with Melvin at the Krack homestead before he died in 2003, and I see some real parallels between him and Lotus Dickey. Both men led hard scrabble working class lives, yet found time to play and share the music they learned from the previous generations, and through the hard times their kept the faith and their music, and would gladly share it with all around them. They were both old-time saints, men who lived to share their joy in music. I’m happy to see another generation tapping into the tunes and the spirit of music as we learn it through the air, there must be something important in this oral/aural tradition, I am happy to be part of it! The Hotcakes played at Max’s on Fri, Feb 20, it was a benefit for Mother Hubbard’s Cupboard, and a great success. We raised a bunch of money, and Max’s had it’s biggest sales night ever. The place was packed with families, babies, toddlers, and shin kickers. I started playing and Shannon juggled and soon we quite the kid mosh pit going on. When Eileen arrived around 6:30, the place was rockin’, and by 7 pm it was packed. I think a number of folks came early because I mentioned I would be there in my Facebook invite, it’s amazing how well that works. As we were early, I set up right in front of the stage, enabling the kids to get up close and dance with the music. It was standing (and running) room only, and I knew not everyone could hear, so I took a stroll around the place, playing to people more than to the room. I had two Happy Birthday tables, and a request for If I Had a Hammer, which I should do more often, with Obama in office, I feel like its hopeful message may come true. We played right up till Kayle Truman showed up with his guitar, and took the stage. He played a bunch of the classic country blues greats like Blind Blake and Blind Boy Fuller. I got to play some backup harp with him, it was some fun, but my best riff ended up being in straight harp rather than the standard blues cross harp. He played in a wide variety of keys (always a good thing), and I was amazed there were tunes I couldn’t accompany for lack of a harp in Db or F# Major. Anyhow, I hope to run into him again, he’s a great performer. Eileen and I have been at the Winter Market three times this year, we filled the early slot twice, not our natural position timewise. But it is so worthwhile doing, we don’t mind. Winter Market has been going great guns for all winter, we played the opening day and it was packed! Come on down and hang with your friends and neighbors, Harmony is buzzing with energy on Saturday mornings.